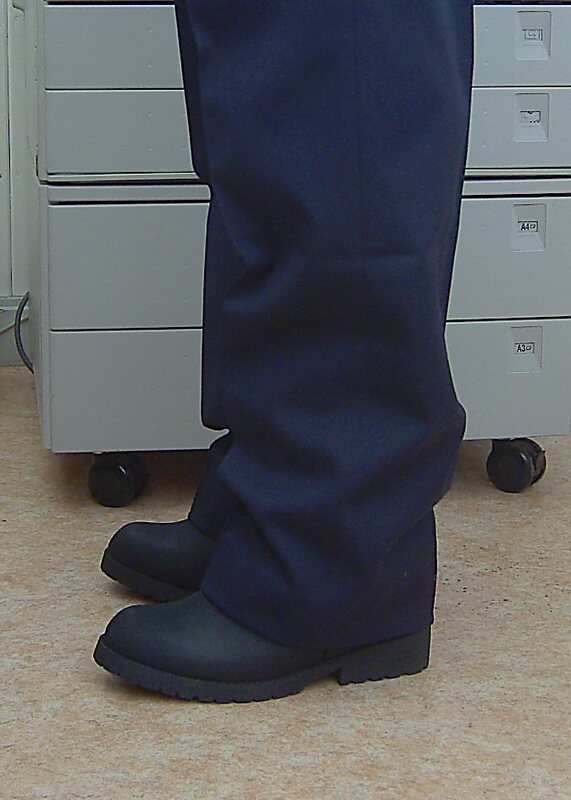 Pictures and product details supplied by member-in-waiting; Russboots. 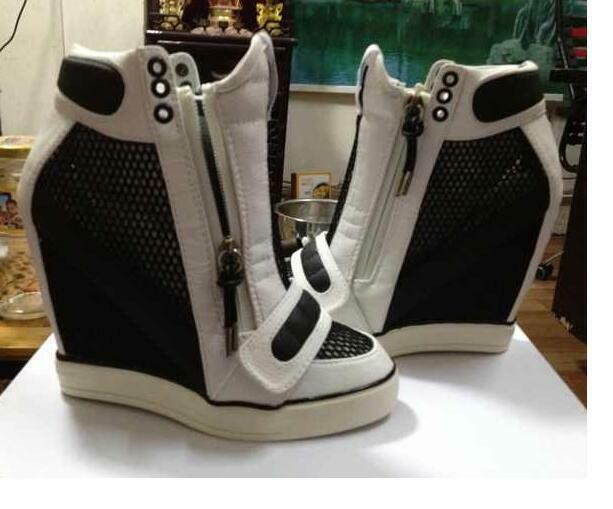 These boots are listed by a number of sellers on the (Western) worlds most popular auction site. 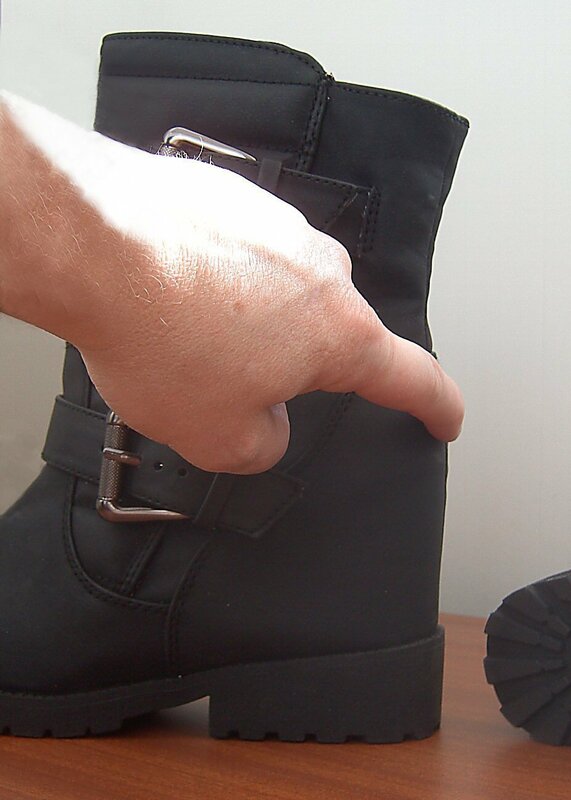 Showing the top of the hidden heel. Worn with regular trousers...... What heel? I'm thinking 100% passable as a mans boot, but with 4 inch heel. Those boots are very stealthy! Must feel great to wear them anywhere. I'm here... Just ordered a second pair while they're still available. They go up to an 8UK, which fortunately fits me. They were a bit snug to start with but have loosened up. I wear them to work, shopping locally, even at home with other people around. I prefer other heels but these are far better than none at all, and they help my back. I must have another look at those. I have them marked in my 'watching' list, but they are always something I think I'll try 'tomorrow'. They do look like a boot that would pass just about anywhere. Yes, they are clearly 'passable' and, if the hidden heel helps with back pain etc, a sensible thing to wear. Personally, I dislike anything as chunky or rugged as these and would not wear them. I don't wear heels just for the lift (pleasant or therapeutic though this can be) and like something that is fairly light in both look and weight, which rules out anything that is clumpy, has a platform of any significance or has very rounded or square toes. And it must be comfortable and (if to be worn in public) not overtly feminine. Under normal circumstances, I would not favour a shoe or boot so macho in look, and it may explain why I haven't yet made a purchase. They are a means to an end though, and something that could be worn that wouldn't ruffle any feathers of those close to home? I have a back problem in that I have a "disc" that likes to slip slightly when I do something stupid with my back. Like lift more than I should, or lift and twist. I have found walking, any type of walking, helps return the offending part of my spine back into the position it belongs. If I'm walking anywhere, it'll be around a retail environment since this helps relieve the boredom of doing something skirting on exercise. And if there's one thing that'll get me doing something close to 'exercise', it would be wearing a heel. I had a very painful and temporarily disabling lower-back problem about eight years ago - sciatica brought on by a displaced disc. Fortunately, it responded to medication, some mild physiotherapy and patience; the disc decided to reposition itself and no further action was needed. Since then, the recurrence of back pain has been rare (and of short duration) and the only other symptom has been a twinge or pins-and-needles in one leg, which is tolerable. Wearing a modest heel does help; it seems to improve my posture, taking pressure off my back. But recently I have developed muscle pain in the other leg and a frozen shoulder - still under investigation but responding gradually to medication (and occasional heel-wearing too). I dislike unproductive exercise of any description and try to avoid it, unless essential to overcome the above problems. (Whenever I feel the rare need to 'take exercise', I invariably find that, if I lie down quietly for about 20 minutes or so, the urge does go away.) I don't regard walking as 'unproductive' as it is a good means of getting around economically (as if you didn't know! ), and can be enjoyable and therapeutic too. Walking round the shops is good; something to look at and pass the time, whether or not buying anything. The worst possible thing to do if trying to avoid back pain was graphically outlined by one doctor, i.e. leaning across a table that stands in front of a sash window and trying to raise that window from the bottom - ouch! From bitter experience, I find that lifting out one's wallet in a shoe shop can be nearly as dangerous, if more immediately rewarding. I had an extremely severe back probkem - a badly ruptured disc that required emergency surgery and my having to learn to walk all over again. I was very, very fortunate in having an excellent surgeon and a happy outcome, helped along by the fact that I had many thousand if mikes of cycling which, the doctors said, gave my muscles the core strength to rebound. I have been very lucky in having few problems in the years since. I take care with my back, and often work at my computer standing up. That is when the geels help take away pressure from my lower back. The second pair have arrived - they (like the first, of course) show as 8/41, so a small 8. Some, as we all know, show as 8/42. Indeed, I have some 8s which are too big. I agree with people about the look - it's not a look I would choose in flat footwear - but they are a means to an end. I'm looking everywhere for a loafer with a 4+ inch wedge heel and no platform, but have not yet located any. I have ankle boots which are pretty much ideal for this, but want something a bit cooler for warmer days. Further to this, my only flat boots are wellies. In flat shoes I go for slip-on loafers (no laces) and toe-post sandals, so my heeled footwear is at variance with this quite a bit, but mainly from the desire not to draw undue attention to myself when I'm in heels and from the dearth of suitable heeled (preferably wedge) versions of my usual footwear. the desire not to draw undue attention to myself when I'm in heels and from the dearth of suitable heeled (preferably wedge) versions of my usual footwear. I'm into wearing a heel, because I like the way they feel on my feet. For me, it's that simple. I would wear a shoe or boot with a small platform for the comfort aspect, not then having to worry about stones or shaped pavers hurting my soles, but even small platforms stop my jeans covering a heel. Wedges I like too, for both the shape, and the quietness of the heel usually. I have found high block heels produce an amazing amount of resonance when landed on something solid, which wedges just don't produce. What's not to like? I like wedges too. On women, wedge sandals can look good and are more practical than stilettos or other high heels - but I don't really like closed-toe 'court' styles (or boots) with a wedge heel; they seem like a mismatch. I can see too the appeal if a man's shoe (or sandal, or boot) has a wedge, giving a discreet height of heel with comfort and ease of walking - but I have yet to try any. The point is, my wife tolerates my heel wearing but maintains that I should wear styles I'm happy for everyone to see me wearing. So these will come out with business suits, for church, etc. I told her they were expensive but she commented they were probably not more than the aggregate for shoes I've bought but rarely wear. The heel height is nearly four inches. I bought them from a store in the USA. They're in the country - I know this as I've just had a bill from UPS. I expect VAT but not their rip-off brokerage charge which comes to almost the same amount as the VAT. I suppose I'll just have to swallow hard and pay it, but it puts me off buying anything else from the USA, and the carriage charges are horrific in themselves compared to those over here. Is ordinary post better in this regard? From your previous posts, I gather that you wear heels as much for medical/comfort reasons as because you like the look or feel. If so, you have a perfectly good reason to wear 'ordinary-looking' men's shoes with an elevator heel - and obviously they are entirely appropriate for you or any other man needing support, or indeed extra stature. Hard luck on being fleeced with a purchase from the USA. My Miguel Jones boots came swiftly by ordinary post with no VAT or other charges, although I may have been lucky. I doubt that using the post rather than a carrier would be a better bet; the Post Office has a dedicated import unit with Customs staff in attendance, although they do not examine everything. Surely, elevator shoes are available in the UK at a competitive price? Actually, I think you are to be commended for putting your money where your mouth is, as it were. True, they will not be as attractive as some feminine styles, but you'll be out in heel. Yay! As to the RM/UPS/Fedex type admin fee for paying your import duties at source for you, this can be avoided with some US suppliers. Ebay (for example) has a procedure for up-front payment of duties. While it means you won't ever escape all duties as some do, at the least the outrageous 'admin' charge is avoided. Thanks for your kind words. Regarding extra height, this has never been a desire with me. If I could get heels that didn't increase my height I'd happily get them. I'm not tall (5'8") but have no desire to be taller except perhaps when trying to get things off high shelves! I'll get my card out and very grudgingly pay UPS as it's more trouble than it's worth fighting, and I want the shoes. Regarding UK suppliers, they have a very limited selection of anything I'd be interested in, with typical lift of 6-7 cm. I need at least 9 for them to be beneficial to my back, keeping in mind the thickness of the sole. Also, even with all these extra charges they're cheaper than I'd get from the UK or EU. Let's hope the quality is as good as promised. I've been told you're much less likely to be charged for goods from China etc. And from America if sent using USPS, or that was the case. Some years ago (7-10), one of the sports I was interested in used to have participants with a similar interest ship stuff over from the US, regularly avoiding any import duties. With UK£pound worth nearly two US$dollars, saving on equipment was enormous, staggering in fact. Never happened to me, most likely because I always insisted the true value of the goods I had shipped, were declared for insurance purposes. Due to the US/UK fear of terrorism, movement of goods between the two countries is much more closely monitored than it was. In fact one of the favoured US sellers popular back then, inferred new laws could give him up to 7 years in jail if caught lying about the contents on the shipping manifest. The shoe company I have used in the US (via Ebay) that uses pre-paid import duties, is Apparelsave. I suspect this function is part of the Paypal/Ebay business, and arranged because their international trade must run into billions. 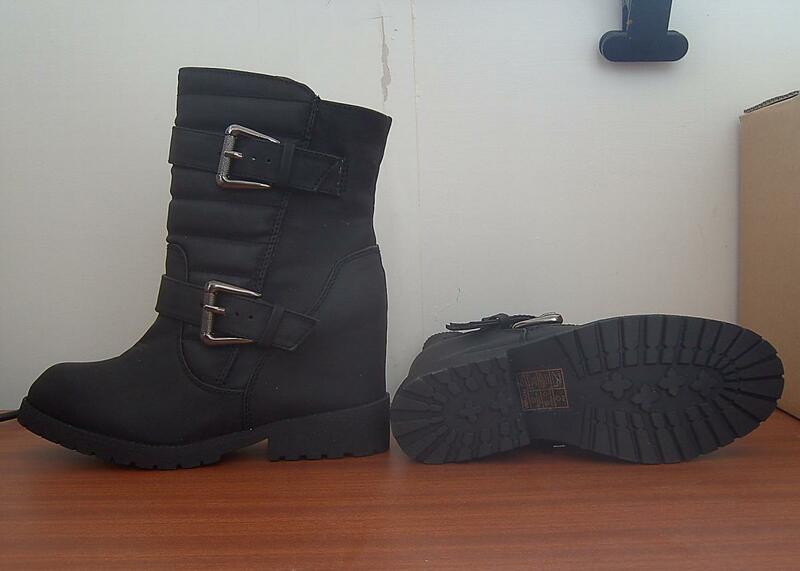 If you buy a second pair of the 'riser' shoes, or recommend them, it may be that buying through Ebay could save money? Most shoe retailers, or brands, can be found on Ebay - though not every brand. Some (Nine West) won't allow direct cross-border sales for fear of upsetting local franchised retailers. Outlets like Apparelsave can/will sell any shoe anywhere. Well, they've arrived, and they're horrible! Beautifully made, but ugly as sin to look at. They are so obviously built up inside and despite my specific question about the inside thickness of the sole they still come out at about an inch, so the actual rise is about 2.5 inches. I don't know whether to bother sending them back as I'll get only a fraction of what I paid for the shoes and the carriage and, most annoyingly, the import charges. I've tried putting a built-up insole in but there's no room without my heel sticking out the top!. I think I'll show them to my wife so that she knows I've tried. I find it difficult to make people understand that I'm not interested in being taller - the important thing is the angle of the foot, so a built-up sole is useless to me. I've wondered whether to rip the whole insert out and put my own in, but then you have the problem of a colossal toe box. If you can truly say that the shoes were not correctly described to you, or not supplied as agreed, then you have a justifiable reason to seek full redress from the supplier - which should include carriage both ways and (arguably) the import charges and fees, if not otherwise recoverable in the UK - which the VAT and any duty should be. As the supplier is in the US, you cannot invoke UK law but I think you will find that US consumer law does provide a remedy. I suggest you look here for guidance: https://www.citizensadvice.org.uk/consumer/buying-abroad/buying-abroad/buying-from-an-overseas-seller-outside-europe/ and otherwise as Google suggests. The initial step is probably to raise a firm complaint to the supplier and see what happens. But imho you should seek reimbursement of all your outlay. Good luck - and let us know how you get on. Will you identify the US supplier to us, or provide a link? Might be worth trying to sell them on Ebay? With correct detailed description of course. Naming and shaming should be done, especially somewhere like HHp that has a worldwide audience. I don't understand the point of hidden heels. Isn't the point of wearing heels - or one of the big points - the visual appeal of high heeled boots? If you go back to my original post on Monday you might understand. 5. Because wearing a 'high heel' is a turn-on and such shoes provide the means. Each to his own, and maybe more than one of the above will apply. If wearing women's high-heeled footwear, there is the additional reason (overlapping with 3, 4 or 5) that they appeal because they are women's. And, of course, anyone could simply say 'because they exist' as personal justification. Yes, I get that part - I've got a dodgy back myself and discovered that the 7cm heels on one of my pairs of boots relieves this stress quite a bit and so fully understand Russ's viewpoint and sympathise with him. But the concealing of the heels - or lifts - within a shoe or boot would by nature make it rather clunky and you would lose the visual appeal of heels. It's like peep toes boots - I just don't get it. I would tentatively suggest, wearing a ladies heel because it looks like a ladies heel, is likely to produce connotations of cross-dressing (androgyny) at best, and transvestism at worst. I have have few experiences myself in wearing an otherwise feminine heel, where I benefited directly from any aesthetic pleasure, save seeing a pointed toe appearing from time to time. While I will agree -since I am as guilty as anyone else is likely to be- I like an attractive shoe, which almost certainly is going to have a high heel attached. But for me, function can surpass form. My Mars-bar shoes ('work, rest and play') are not attractive, but are really really pleasant to wear. Russ has said his motivation is to wear some heels that would pass casual inspection at any event, and especially any family event. The rather obvious solution is a shoe with a hidden heel. It ticks his "bad back" box if the rise is sufficient, and hides or disguises the fact he is wearing a heel sufficiently to avoid cause for concern from his partner. Sadly, the 'lift' in the shoes delivered, fail the primary reason for purchase, despite his care in ensuring that did qualify as being suitable. I would think under usual circumstances, purchasers of this 'lift' shoes, are going to be fellas who might feel height challenged, and are looking for a height boost - hence the accompanying platform with the hidden heel.